A friend sent me a few courses from the AKC World Team Tryouts in Hopkins, MN. In general these were more technical than the usual offering on an AKC weekend. You might expect that from a “World Team Tryout”… dontcha know. I stumbled across one course that literally made the hair stand up on the back of my neck. So I must share with you. A pull-through blind/managed approach from the teeter at #4 to jump #5. A counter-side tunnel discrimination at #9. A rip-saw turn out of the pipe tunnel at #9. 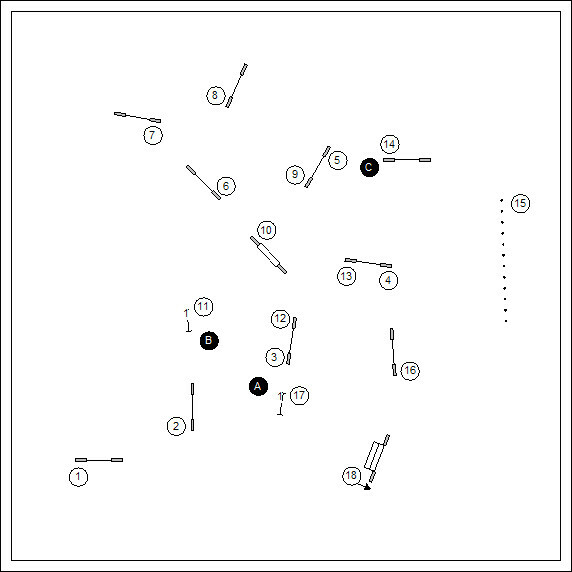 A two-jump directional discrimination on the dismount of the dogwalk at #11 (clearly favors dogs with 2o2o contacts; deadly to dogs with running contacts). A tight pull-through from jump #12 to the A-frame at #13. A perpendicular approach to the entry-side weave poles (out of a wrong course trap). There are two places where one can actually release the dog to work. 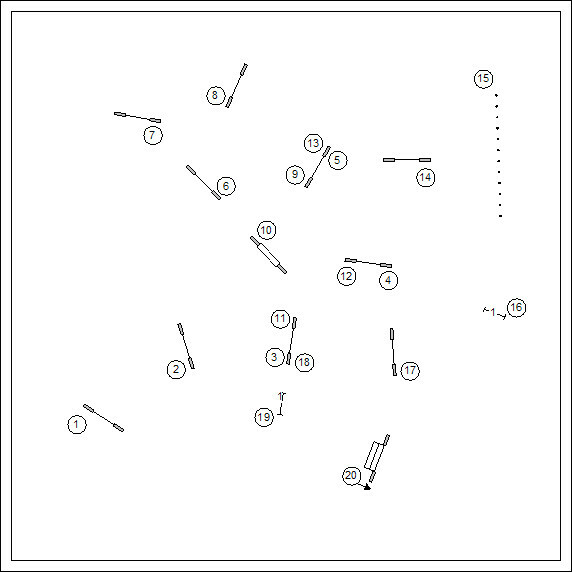 The first is a two obstacle sequence (#7 to #8); and the next/last is a two-obstacle sequence (#16 to #17). As a strictly philosophical matter, I really don’t like this course. I’ve invested a lot in teaching my dog to work independently without constant micro-management. This is a course in which a dog with superb independent working skills is of no value whatsoever. The trend to ridiculously technical has been mostly a USDAA thing the past few years. I’ve noticed that AKC courses—at least where I’ve been showing—tend to be more thoughtful with flow that allows the dog to get up working at full speed so even subtle challenges require spot-on timing on the part of the handler. Consequently, I was surprised to see this chamber of horrors. Where are we going as a sport? 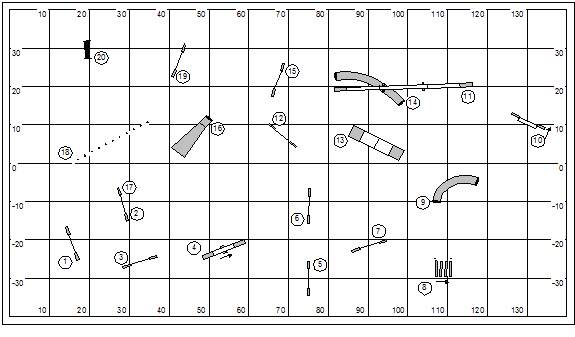 I know for sure that no-one really looks to me for the philosophical underpinnings for course design. I’ll vote with my pocket-book. I apologize to Anne Riba for the tough review. I know that course reviewers are a powerful influence on what the AKC judge puts up in the world. 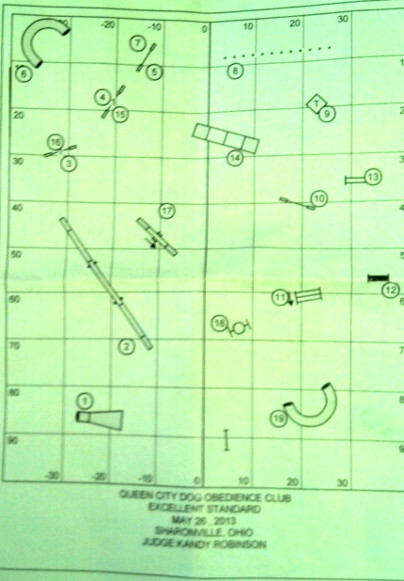 The role of the course reviewer should be to save the designing judge, not to damn her. I’ve been remiss on keeping up with my blog. It kinda works like this… I’ve had a long string of weekend obligations. So when I get home I’m caught up in chores and work obligations related to the TDAA. This past weekend I was in Tennessee leading a TDAA judges clinic. This is ostensibly a 7-1/2 hour drive each way. The return trip was pretty awful. There was a huge rain system… and I was driving along with it; so I couldn’t get out from under it at all. You’ll remember that last year I totaled my Suburban and nearly killed myself. Thus today I’m a more cautious driver in funky weather. I had a recurrent image of hydroplaning so I slowed down about 15 MPH below what I might be driving on a dry road. Apparently not everyone was driving cautiously. Early in the afternoon I got caught up in a huge highway backup in which I traveled about three miles in three hours. There was apparently a multi-car pipe-up somewhere ahead. Later in the day I ran into another stopped traffic scene; again, a multi-car accident some miles ahead of me. This time I find myself near a “No U-Turn” crossing. I promptly took the U-turn, drove back about six miles and went off the Interstate and found a country road. After about 30 miles of my Garmin insisting that I take a U-turn to go back to join the stopped traffic, it finally plotted a course forward. I got home at 1:30 in the morning. In the spirit of Live to Run Again, I spent the trip listening to the first two books of the Hunger Games trilogy. The second book finished neatly as I arrived home. Real Dogs Don’t Wear Tags! After a seminar day at QCDTC I stayed over for the weekend AKC trial hosted by the Greater Cincinnati Poodle Club. 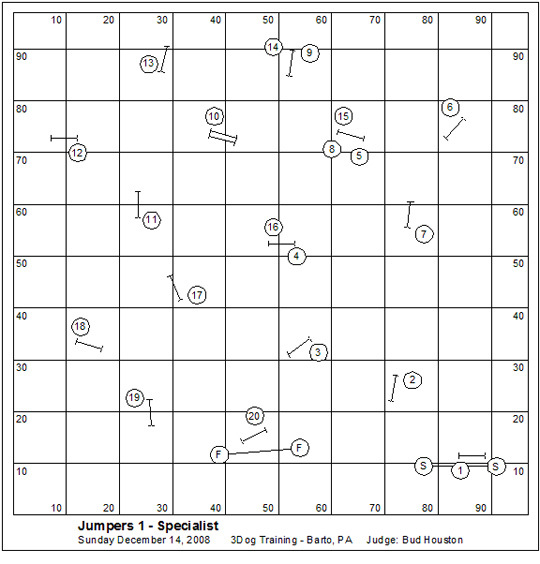 The morning started with a very fun romp of a jumpers course designed by AKC judge Karen Wlodarski. I got to run both Hazard and Kory on this. Hazard ran clean tho not terribly fast. Kory is a different matter altogether in terms of both speed and challenge. I must say that the course went exactly as planned; we escaped all the subtle options (I’ll describe below). He gave me a stunning run, according to plan. The judge NQ’d us anyhow, because I failed to take his tags off before the run. The judge was very nice about it and didn’t blow the whistle until after our run. I was nonetheless very pleased with Kory and don’t care that much about the Q anyhow, as it turns out. Just to make myself feel better about it I phoned home and blamed Marsha for not reminding me as I walked out the door, as she usually does. Those of you who run more than one dog are familiar with the idea that you can take very different views of course strategies based on the individual needs and quirks off your dogs. In my whole agility career I’ve never run two dogs who were so dramatically different than Hazard, who I drag laboriously through the course, and Kory who I push great distance with little effort, and a lot of conversational handling. 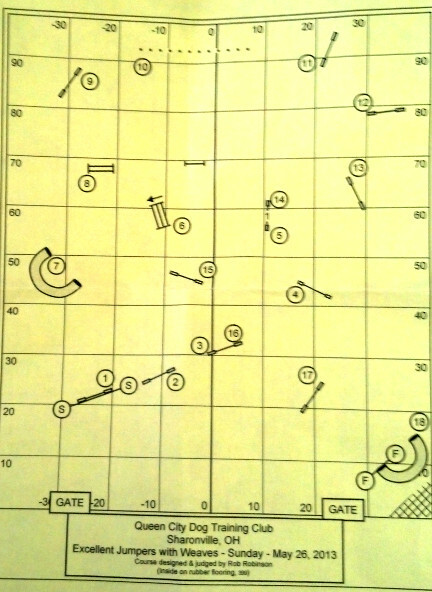 The first half of the course is dog-on-left which might seem unimaginative. It is, in fact, a speed building rip that has a couple subtle wrong-course options for the unwary. While these options weren’t so compelling for the smaller dogs a number of the big dogs demonstrated the possibilities. 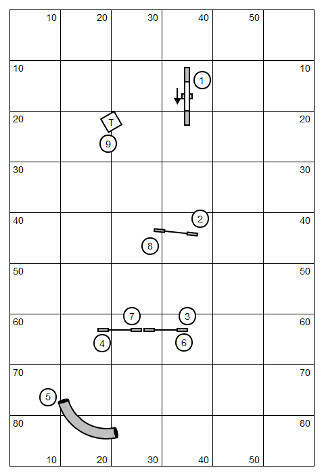 After jump #3 is the triple in a nice straight line. And after jump #4 is the gratuitous and flatly presented dummy jump. The technical part of the program begins on the dismount of the weave poles with, again, a couple wrong-course options when entering the pinwheel. As it turns out the real challenge in this course was the awkward approach to the #18 jump. 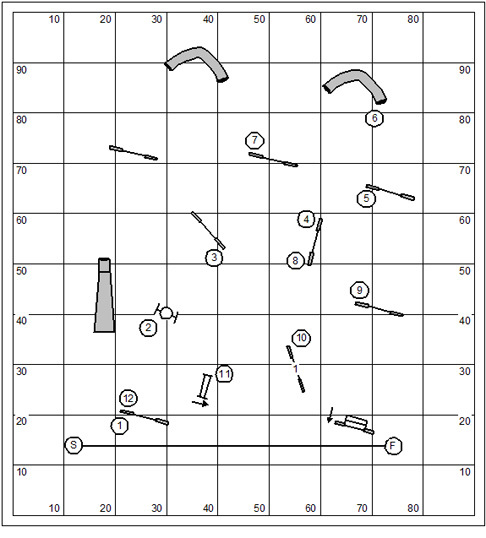 A simple analysis of the dog’s path in this course will show a line that slices by the #18 jump for a refusal. We saw that plenty today, even with the small dogs. What I did with Kory at this point was turn him to the right as though we were going back to the weave poles, then flip him left as the approach to the jump opened up. 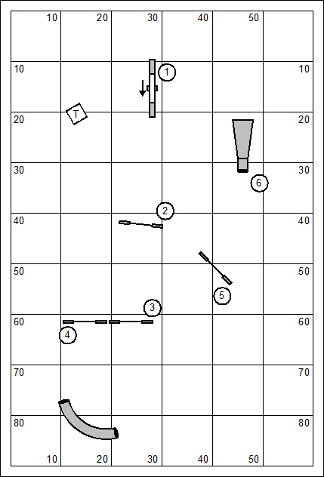 Funny thing, I had also agonized about the final wrong course option, presented by jump #1. I Q’d both Hazard and Kory in the standard course, so, not a bad day. With any luck my pups will have the same edge tomorrow! I had a fun and interesting day at the Poodle Club AKC trial in Cincinnati. I have this great relationship with the Cincinnati club. I lead a seminar on Friday in exchange for entries and expenses for the weekend (travel, accommodations and entries). So they get this inexpensive and hard hitting warm-up for the weekend… and I get to show my boy on a great surface in a top notch facility. Not a bad trade at all. Tho next time I think I’m going to upgrade my hotel. The Motel 6 is rather more Spartan that a Red Roof… if that’s saying anything. In the analyses that follow I want to remind you that I’m cultivating the Old Man’s Handling System. 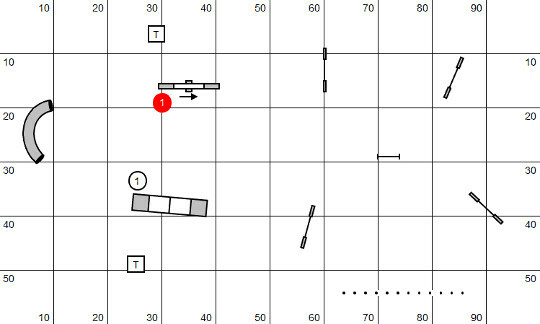 Fundamentally that means the I look for the control positions on course and then use my dog’s terrific distance working skills to allow me to work from control position to control position while he works away on the more mundane and obvious sequences. This is a unique system in our culture. And since no-one else has taken the effort to document the beast, I will endeavor to do so with my own exploits. I was slow to rouse in my hotel room even with a timely wake-up call this morning so I missed the walk-thru for T2B. 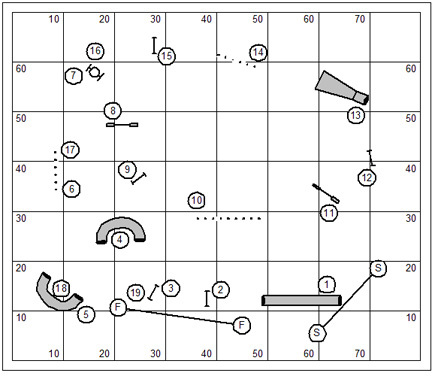 But don’t you know T2B is about as complicated as a Novice course so I scammed it on the course map and it all went just hunky dory. Watching most of the class before I went into the ring the problematic part of the course was on the dismount of the weave poles as many dogs had such focus on the pipe tunnel ahead that the turn to jump #13 was a rocky moment in the course. 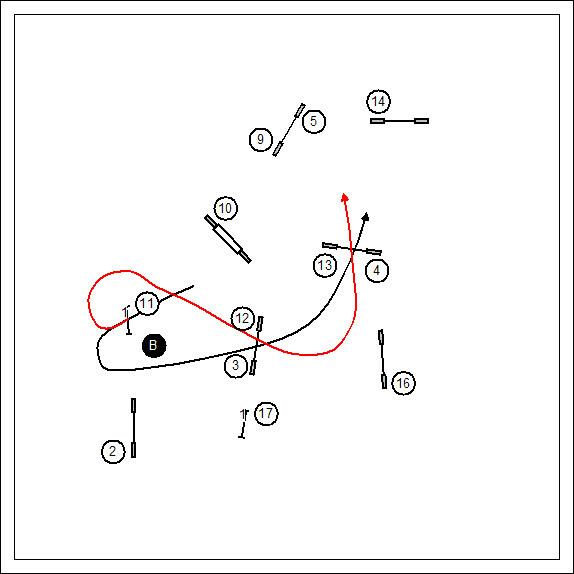 I took a nice long parallel path lead-out before releasing my boy and then sent him down through jumps #5 and #6, calling him back up through jump #5 to the teeter at #8. My control position was near the dismount of the teeter. 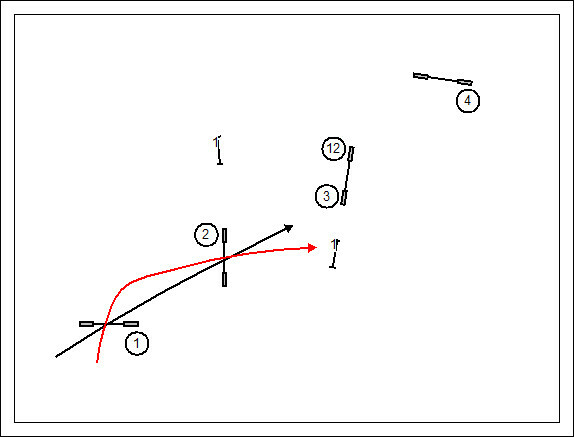 I gave him a “Left” at jump #10 and layered to the opposite side of jumps #9 and 10 as he did the weave poles away. 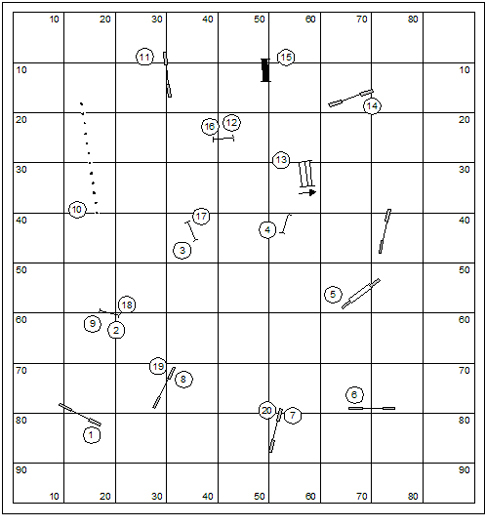 My answer to the problem bit in the course was to have the distance to easily sell the turn to jump #13 and then flip him away to the pipe tunnel. This was a fun start to the day as Kory had a nice clean run and the fastest time of all dogs. It was THE Time to Beat. He’s been in T2B four times now and has 40 points going forward. Straight away I need to identify my control positions on this course. This was easy for me to figure. Note the hard dismounts from both the teeter and the dogwalk. Kory is a leggy enough dog that he can have a 2o2o on a contact… and not actually have his back feet in yellow paint. So my control positions had to be at the tippy end of both obstacles so I could keep his body straight. I suppose I should teach a straight dismount; but it’s counter-intuitive that he should face straight away when I’m behind him. The answer is to not be behind him. So I started with him up around jump #3 and send him down to do the 180 turn. This allowed me to do a nice front cross and draw him through the double at #3 and had me right there with him on the dismount of the teeter. So I pulled him around right and sent him down through #6 and on to #8 while I layered to the opposite side of the table. Yeah it was an impressive bit of distance work. Get over it. That’s Kory through and through. He doesn’t need me in any proximity at all… he’ll just keep working. I worried a little over the dummy jump beyond jump #8. But you know, I told him “Left! Lie down! Walk up!” (yes, I really did say all that) and it wasn’t anything but the dogwalk for him. Before I go on I should say that Kory won the class as was fastest time in the building… I mention it here because it was the neat turn from the dogwalk to the table that made the difference in his time and just about every other fast dog time. With most every other handler racing their dogs the length of the dogwalk, no other dog but Kory had the perfect 90° turn off the dogwalk to the table. And that was the consequence of my control position. 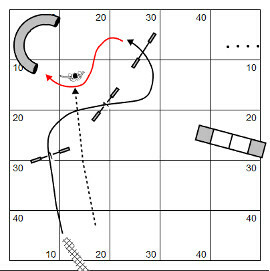 From the table it was simple to turn him left at jump #11, through the tire, on to the tunnel and into the weaves, the turn to the collapsed chute, the turn away into the pipe tunnel at #16. Now we arrive at the place in the course that NQ’d most everyone who NQ’d on this course… and that is the turn from #17 to #18. 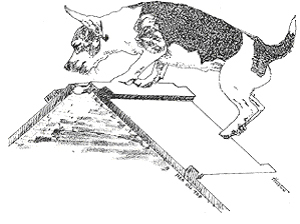 You’ll have to recognize that the dog has a very foreshortened turning radius between these two jumps and with the compelling collapsed tunnel in the transitional turn more than a few dogs got the refusal at jump #18. 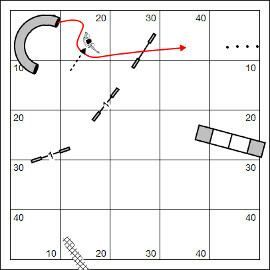 So savvy handlers would step up to the corner of jump #8 to show a squaring Front Cross… but this left them hopelessly OOP to manage the approach to the tunnel under the A-frame discrimination. For me it was a magic moment. I’ve spent a lot of time teaching Kory the name of the obstacles in the discrimination; and he has about a 90% success rate with the discrimination by name only. 90% was good enough for us today. I didn’t have any kind of control on the downside of the A-frame. But Mr. Etzel determined that it was good to go… so I released him on to the final jump while I was considerably behind. By the time the dust settled on the standard class I was feeling pretty invincible. Can you say “Cocky”? 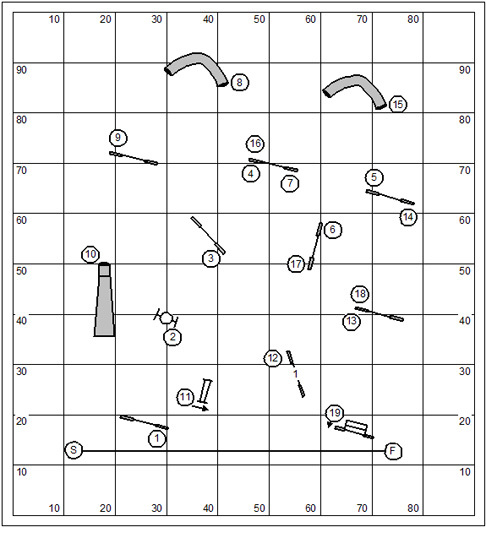 What I was most worried about on this course was selling the turn from jump #9 to #10 without losing my boy into the pipe tunnel. I was prepared to show a pre-cued Flip that would absolutely thrill the natives. But I lost Kory to the wrong-course single-bar jump along side the triple in the turn from jump #6 to #7. I had the good grace (I’m thinking) to depart the course with my failed plan. So, I won’t bother to share the rest of my handling plan. Pride goeth before the fall, don’t you know. Issue #0 is the training manual for distance work intended as the foundation for the continuing series. The Jokers Notebook is the natural progression and evolutions of Bud Houston’s distance training originally published as Go the Distance. Jokers Notebook #0 is an electronic book for download only: Our Price: $10.00. For awhile I’m going to work through the Alphabet Drills designed by Nancy Gyes. Being an orderly person, I’ll just start at “A” and work my way through. While this practice furthers my own training goals with my boy Kory, I tend to inflict what I’m working with on my own students in equal measure. We used the Tin Cup training format. 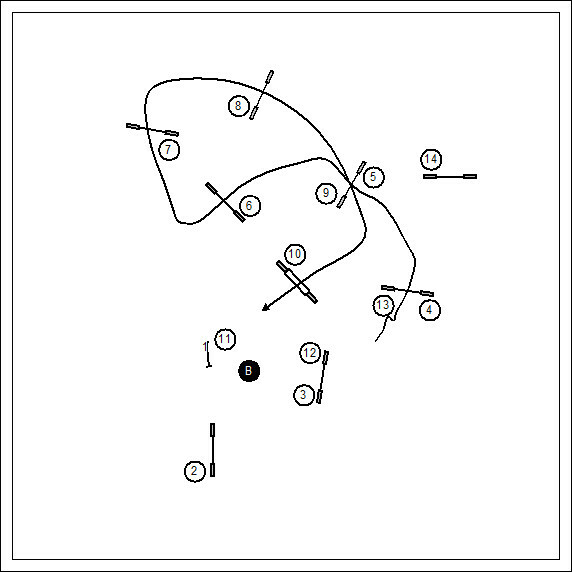 In this format we approach each sequence like a game of golf. I documented the rules for that format here: http://wp.me/pmSZZ-OG. Note that I added the two double-bar hurdles to the exercise. Nancy’s original uses all single-bar jumps. I include them because we’ve seen so many badly presented spread hurdles in AKC play lately that I want to make sure to include them in our practice. Anyhow, I picked up two strokes on this sequence; having otherwise played a perfect game in the other 7 holes. The letter “A” Alphabet Drill originally appeared in The Clean Run Magazine in February of 2005. Monica is sending me a copy of the compilation workbook (it’s in the mail) which includes a CD with all of the drills in .agl format. 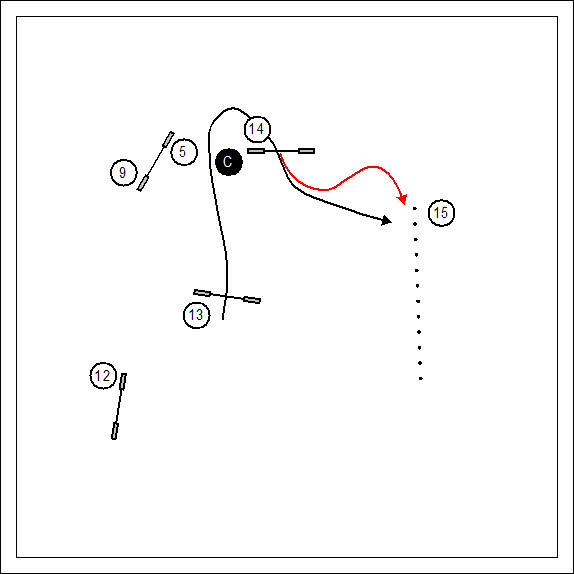 You really should get your copy to follow along with me as I work through these drills. I know I have a thousand of my own exercises. You should know that I make it a point to run courses that I didn’t design, and practice exercises that I did not conceive. It’s a funny psychological thing; I tend to design to my own strengths and my own warped perspective of the world. It’s very important for me to experience the warpage of other agility designers; because that’s what you get in the real world. The Alphabet Drills are the copyright of Nancy Gyes. Questions comments & impassioned speeches to Bud Houston BudHouston@hughes.net. The Country Dream web store is up and running. www.dogagility.org/newstore. Be sure to check out my distance training series: The Jokers Notebook; an (inexpensive) elaboration and improvement on the work I did in Go the Distance. You are currently browsing the archives for the AKC category.